Not really sure how this is going to go, but…let’s learn about creating a book. I love printed photography. There’s something about seeing a nice, big print of an image that I find really satisfying. I’ve printed large copies of several photos from the project over the years, hanging them around our apartment or in my office. 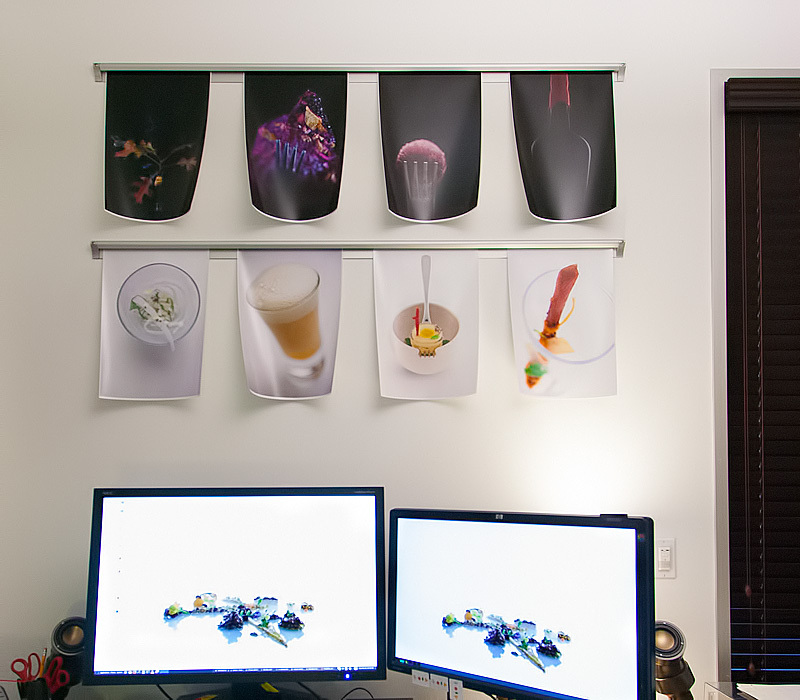 It’s fascinating for me to see the tiny bites of Alinea’s dishes in a large format; there’s so much room to scrutinize all the little details that get lost in the small images included on this blog. 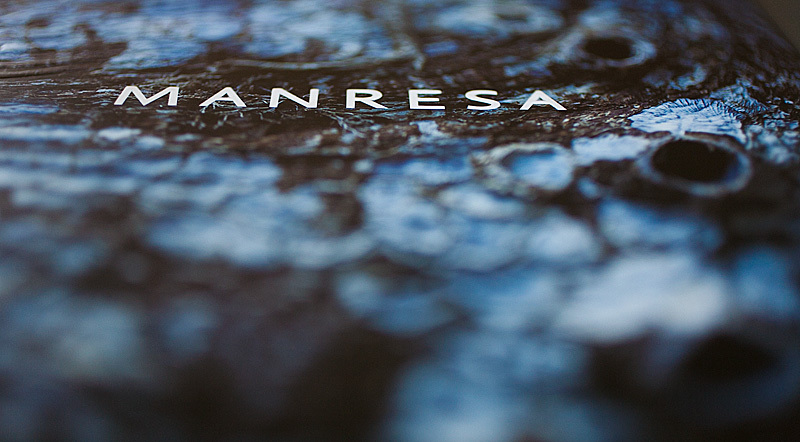 Sarah and I have had a handful of photo books printed for ourselves over the years. The first one I did was a small collection of pictures of my niece taken just after she was born. 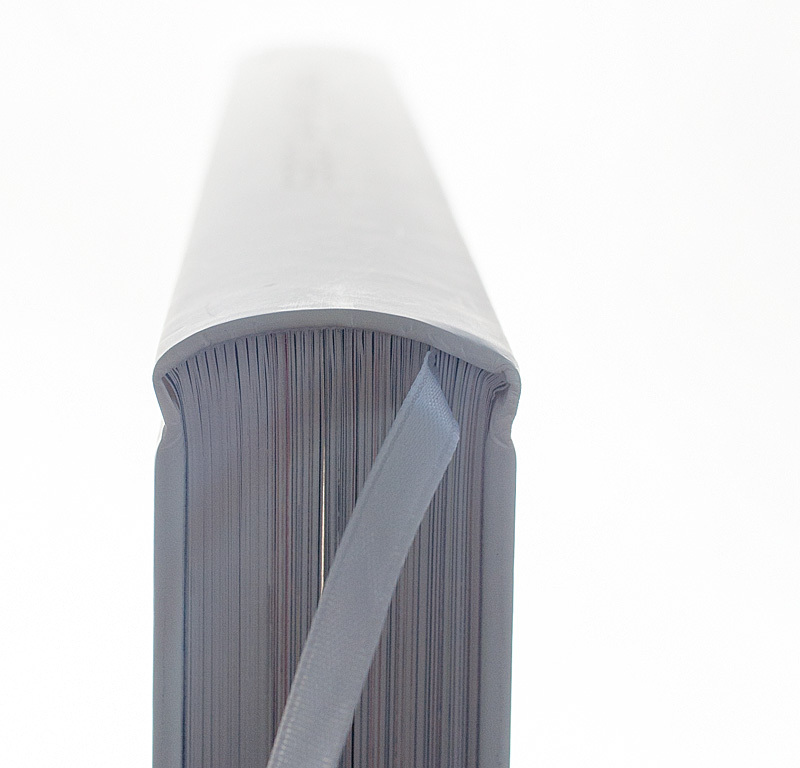 The book was very simple, containing full-bleed photos on each page with a tiny bit of text scattered throughout. Shortly after this, Sarah undertook a fairly massive project wherein she rescued a large box of decaying photo albums from her family’s garage in Kentucky. She scanned and painstakingly-retouched every photo, then designed a new set of hardcover books to archive everything. In both of these cases, we used an online printing service called Blurb to manufacture the books. Blurb is one of a handful of “print on demand” services (Apple’s iPhoto offers a similar service, and there are others). The phrase “print on demand” (POD) refers to the technology used to manufacture the book; it centers around a large printing machine that can print and bind a book all in one go. The upside of POD is that there are minimal setup costs; one can simply submit a digital copy of a book and produce an arbitrarily-small number of hard copies (in both cases above, we printed less than 10 copies of each book). Blurb, Apple and others offer templates to make the digital assembly of the book easy and straightforward. Drawbacks to services like this include limited flexibility and, in some cases, inferior product quality. Blurb, for example, offers book printing in one of a handful of pre-set sizes; if I want to deviate from one of these options, I’m out of luck. 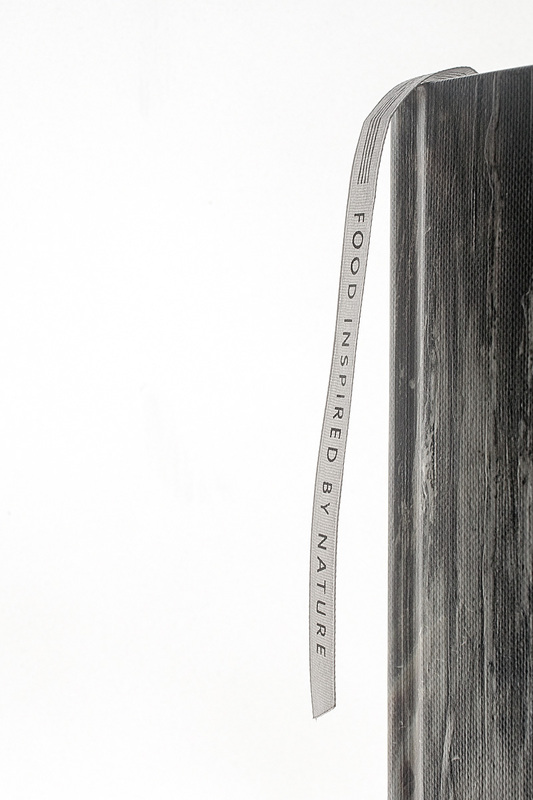 Binding options are limited as well; while Blurb offers the option of soft- or hard-bound covers and the potential inclusion of a dust jacket, fancier techniques like foil stamping, spot-varnishing, or embossing aren’t available. Regarding quality: while Sarah and I were reasonably happy with the quality of the Nola books, the Wilson albums–which were quite a bit thicker and heavier–suffered from poor-quality binding. We found too that, although the print quality of the books’ contents was adequate, it wasn’t particularly awesome. There’s no real way to proof colors or finesse things; you get what you get and that’s about all you can control. Late last year, as I realized I was closing in on actually finishing this project, I started to think again about collecting my photos into a book. I found Blurb’s limited options less than exciting, and wondered what might be involved in making something a little more special. I’ve invested so much time in all of this that I thought it’d be cool to make something befitting the overall vibe I’ve tried to capture with this project. In casting about for ideas, one obvious resource I thought to consult was my collection of cookbooks. It’s probably unsurprising that I’ve amassed a sizable collection of cookbooks over the past five years; a good number of them tend to be awesome beyond just the recipes they present. In thinking about what I wanted my book to be, I started looking through my favorite cookbooks, trying to figure out what about each of them was so compelling to me. For starters, I love big, fat cookbooks; ones with a solid heft when I pull them down from the shelf. I love pages printed on heavy paper, thick and not too glossy, with crisp blacks and deeply-saturated images. Some of my favorite books employ interesting design elements or printing techniques, or even different types of paper within the book. I also love books that have a very tactile quality, both inside and out. This, I think, is poetically-appropriate: food is multi-sensual, so it makes sense that the most awesome cookbooks seek to be this way as well. 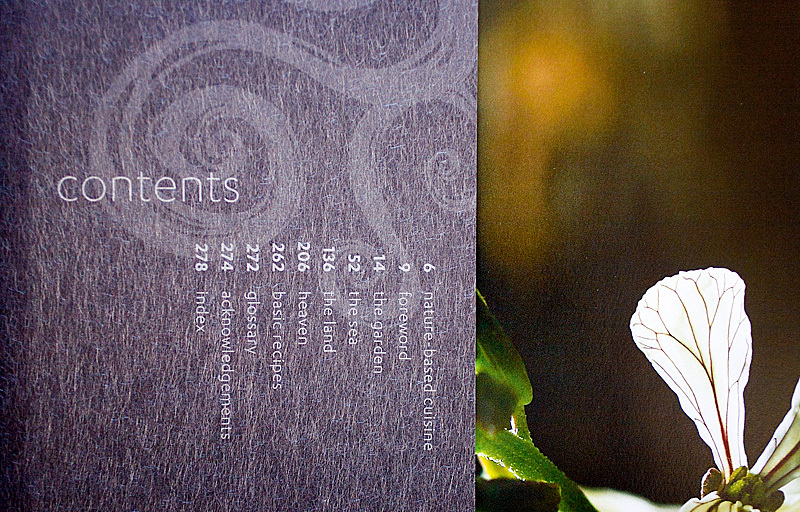 I particularly love covers with interesting embossing and debossing, or a fine-grain texture that feels fun to touch. I can’t take out some of my favorite books without absentmindedly running my hand over the covers, feeling the textural qualities of each. For this reason, I find that I dislike paper dust jackets; they rarely have interesting textural features and seem to always rip or crease. In fact, the first thing I typically do if a book is wrapped in one is remove and discard it. Blurb and other POD services offer nothing like any of this. I wondered what it would take to create a high-end book, printed to my size specifications at a very high level of quality, and with an interesting, durable, and tactile cover. I consulted the back pages of some of my cookbooks for information about where they’re made; most listed author and publisher information, but those were my only clues. I supposed printing was usually something handled by a publisher. Having a book made through a big publisher seemed like a daunting proposition though; I didn’t even really know where to begin, plus I wasn’t sure it was the route I wanted to go. Mostly I was just interested in making something for myself; trying to court a publisher for the sake of printing a single book seemed like a really heavy hammer. 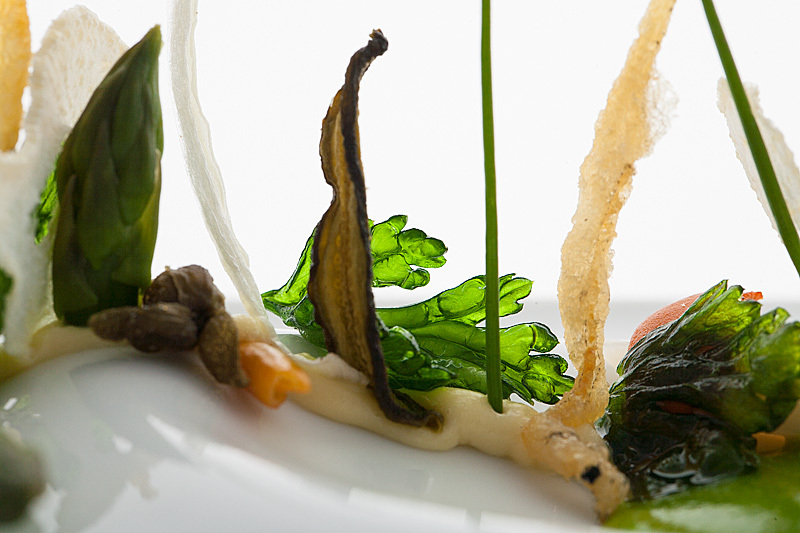 Then I remembered something interesting: Modernist Cuisine was self-published by Nathan Myhrvold and his team. They hadn’t gone through a large publishing conglomerate, they’d just done it all themselves. This was appealing to me for obvious reasons. I grabbed a volume from Modernist Cuisine, flipping to the back pages of it. Sure enough, there in the colophon was listed the name of a printing house in Seattle that had handled the manufacturing of the MC books. 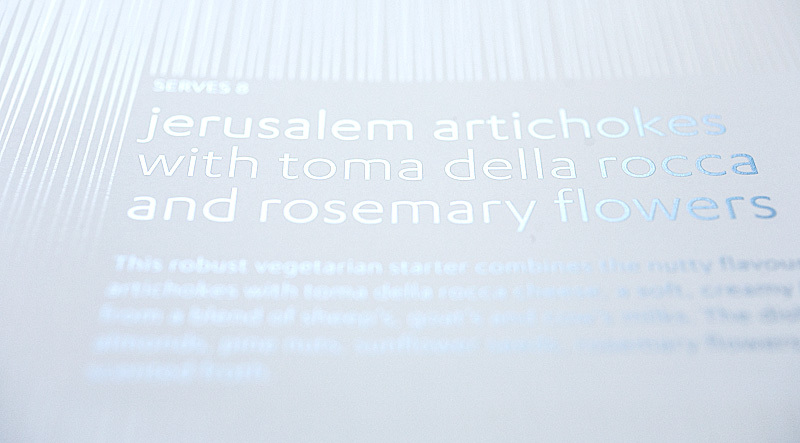 Gary explained that most cookbooks that had been printed in any sizable amount had most likely been made using “offset printing”, a technique by which an image is transferred first to a printing plate, then pressed onto a sheet of paper. The process yields not only a higher-quality final image than that of POD printing, but also very high consistency for multiple prints. The downside with offset printing is that there is considerably more setup involved; printing plates need to be created, and maximizing print quality potentially involves extensive proofing tests. While the per-book cost of offset printing is much lower than that of POD printing, the prepress costs tend to make the process only economically-viable for larger-scale print runs.To get the kind of quality I was after, then, I would need to do a run of several hundred books. I nodded, pondering this idea. I mulled the idea over in my head for several weeks, unsure of how deeply I wanted to get involved with it. Making a really deluxe photo book was an idea that strongly appealed to me, but I wasn’t sure about the writing end of things. After some vacillation, I decided the only way I could find out whether I wanted to do this or not was to just try doing it. So one afternoon, curious what (if anything) would spill out of my head, I sat down at my laptop, opened up a blank document, and started writing. Five months later, I stopped. Sarah was right; in rereading back through this entire blog, there were a good many stories, discoveries, and thoughts I’d never saw fit to include. It was also interesting to be able to connect dots with the benefit of hindsight that I wasn’t able to connect in the moment; even in writing I found myself learning more than I thought I already knew. As I completed sections of writing, I handed them off to Sarah, who played with typesetting them alongside photos we were choosing from the project. We also spent time learning about assembling the book, poring through paper options and printing techniques to try to identify what would be maximally awesome for this. Together, we’ve been coming up with something I’m really excited about. Taking a step back to survey the result, I realized it might be worth asking myself a rather terrifying question: could there be anyone else who would like a copy of such a book? To try to answer this, I’ve decided to try using Kickstarter. The idea with Kickstarter is that a person like myself can posit an idea and state how much it will cost them to realize it. Others can volunteer to chip in; often to be offered a “reward” for their donation (usually a product generated by the Kickstarter campaign). In my case, I’m interested in seeing if there’s enough interest in this book to be able to do a print run of it. It’s probably no surprise that the process of doing this is just as fascinating to me as any other aspect of this blog. For those who’d like to participate, I plan to share the process as it unfolds via the Kickstarter campaign. Would you like to come along for the ride? Good luck with this! 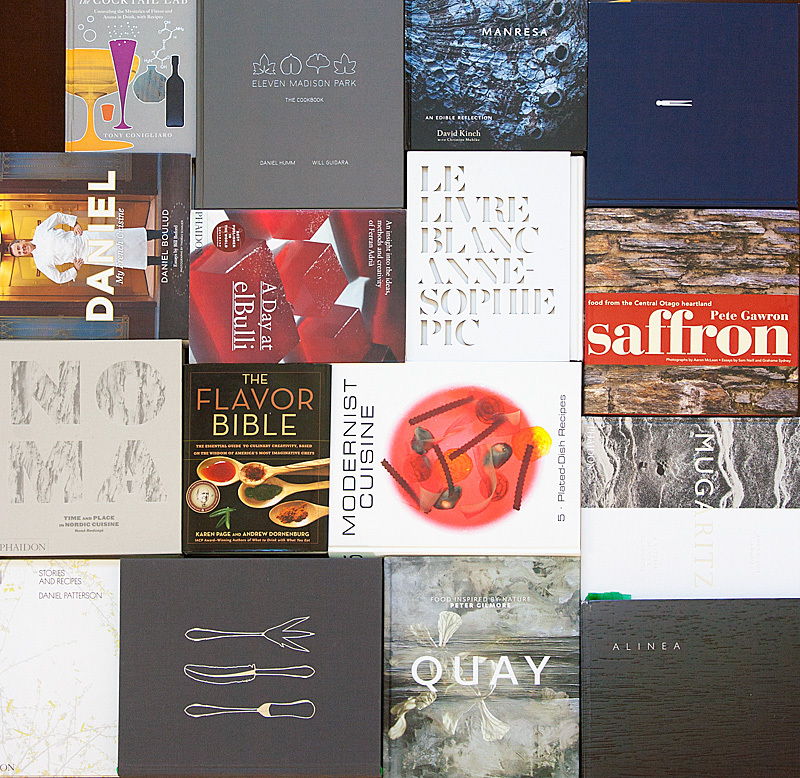 Much like you, I’ve amassed quite a collection of cookbooks and couldn’t help but notice the multiple images from Quay that you featured on this post. I think it’s a great book both in terms of content and production value. 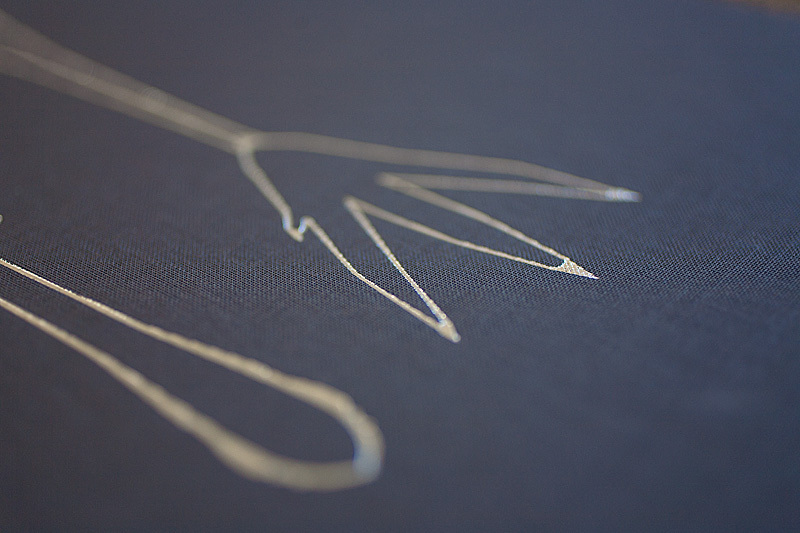 Have you had a chance to check out the Sat Bains book? All the best! Hey thank you mike! Yeah I love the hell out of that Quay book, it’s SO beautiful. And, I haven’t checked out the Sat Bains book…is it awesome? Yah, Sat Bains is cool. Among other things, it shares a similarity with Quay in that both books use multiple types of paper to create different textures. Other than that, it’s a great book. Nice photos, Sat’s a pretty cheeky guy and the food looks tasty. Well worth checking out. Wow, this is so exciting! I’m totally in. Also, congratulations on finishing that last dish! P.S. I just watched the Kickstarter video. I think that this is the first time I’ve heard your voice! Hey katie! Thanks so much! And you know, I specifically thought about the voice thing with you, if you can believe it; when I saw you on that video conference a while back I had the same reaction about you (“Huh! her real voice sounds very different than the one I’ve always pictured in my head!”), and when I was editing that video I thought “I wonder how different this sounds than whatever voice Katie has pictured in her head”. Very exciting. Looking forward to seeing the final result. Speaking of hefty books, one of my latest ones is Historic Heston. That’s a book with heft and superb packaging. 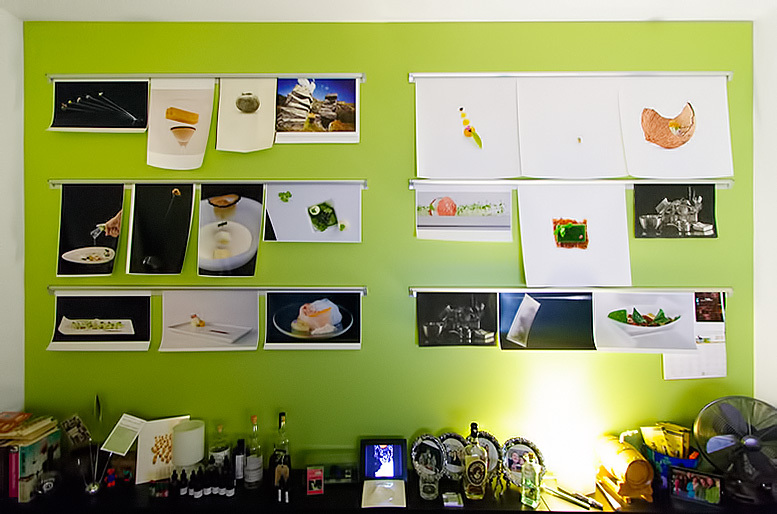 The pictures are similar to the ones in his Fat Duck cookbook. Really worth your time.